Although dyes are widely used in textile industries, they are carcinogenic, teratogenic and mutagenic. Industries discharge their wastewater containing a variety of colors into water resources and make harmful effect on the environment. The present study aims to Evaluate removal of reactive red 198 by nanoparticle zero valent iron (NZVI) in the presence of hydrogen peroxide from aqueous solution. The effective parameters on the removal of dye such as the hydrogen peroxide concentration of NZVI, contact time, pH and dye concentration were investigated and optimized. According to the results, the combination of NZVI with hydrogen peroxide is more effective than single hydrogen peroxide. At pH = 4, contact time= 40 min, 200 M of hydrogen peroxide, dye concentration= 75 mg/L and concentration of NZVI 2g/L, color removal was achieved 91% approximately. Based on the results of experiments, using hydrogen peroxide- NZVI has high efficiency in removal of azo dye type. A wide variety of polluters including chlorinated organic compounds, polychlorinated biphenyls, heavy metal ions, oxy-anions and dimethyl phthalate could be decolored with Nanoparticles Zero Valent Iron (NZVI) [15, 16]. Furthermore, inactivation of microorganisms in drinking water, wastewater, surface water and other resources are some applications of NZVI . Colors are kinds of chemicals that may be unstable by this process and recently some azo colors are used for investigating on degradation [18, 19]. 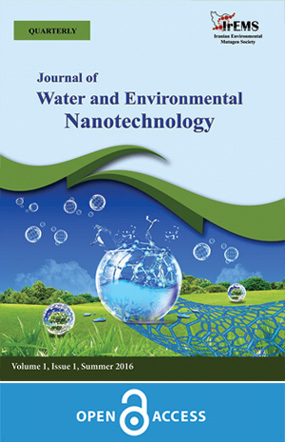 So, according to the introduction, due to the high efficiency of this process for removal of various polluters like chromatic materials, the main purpose of this study is to evaluate the efficiency of hydrogen peroxide with the presence of zero-valent iron nanoparticles for removal of Reactive Red 198 solutions in water. All the sodium borohydride and ferric chloride (96%w/w) were supplied from Merck and High Media Co. respectively. Synthesis of Nano-particles zero-valent iron Nanoparticles were synthesized by adding the solution of sodium borohydride 0.16 M to the solution of hydrated ferric chloride 0.1 M at ambient temperature. In order to produce the Ferric chloride solution, deionized water that neutralized with N2 gas is used. In order to produce a solution of sodium borohydride, Sodium hydroxide 0.1 M is applied. After preparation, a solution of sodium borohydride is added to ferric chloride solution drop by drop and in vacuum conditions and intense mixing. This phase takes about 30 min. During the process, the beaker was closed so that the synthesis takes place in a vacuum condition. Sodium borohydride reacted with ferric chloride according to first reaction and finally it leads to Fe0 revival. After reaction, iron nanoparticles were deposited in black particles. Reaction was conducted under hood because as a result of chemical reactions, hydrogen gas is produced. In addition, it is necessary to mix reaction vessel with a blast-resistant hopper to reduce possibility of ignition. SEM electron microscopy is used to determine characteristics of iron nanoparticles. For measurement pH with pH meter model Mettler Toledo and to pH adjustment we use Sodium hydroxide (1.5 mol L−1) 0.1 N and hydrochloric acid (37%w/w) 0.1 N. Reactive Red 198 is a color-molecular-weight anionic equivalent of 968.21 g/mole and absorption peak λmax=530 nm. Reactive Red 198 (C27H18ClN7Na4O15S5) which is used in this study is of laboratory type and manufactured by Merck, Germany. Chemical formula of this compound is shown in Fig 1 . In this research, studied variables include: exposure time (5, 10, 20, 40, 80 min), initial concentration of nanoparticles (0.5, 1, 2, 3, 4 g/L), pH (4, 6, 8, 10), hydrogen peroxide (25, 100, 150, 200, 300 Mmol) and initial concentration of reactive red 198 (25, 50, 75, 100 mg/L). To perform experiments, different concentrations of color was added to volume of 250 ml to 500 ml beakers and pH of color was adjusted in desired range. Then, different concentrations of nanoparticles and hydrogen peroxide were added in 250 ml of color with different initial concentrations and after mixing by jar with around 250 rpm at certain intervals, sampling were done. Remaining concentration was determined by rate of absorbance and using a calibration curve. In Fig 2. image of synthesized nanoparticles is shown. results of SEM particle, shows size range of particles in nano limitation (diameters of <100 nm). XRD pattern of dry NZVI particles was shown in Fig. 3. X-ray diffraction (XRD) analysis (Siemens, D5000 with Cu Kα radiation) was used to determine the presence of zero-valent iron nanoparticles in the studied absorbent structure. XRD pattern of Fe0 is visible in Fig. 3. The peak at the 2θ=44.7◦ indicated the presence of NZVI in the synthesized absorbent structure. Results are shown in Figs. 4 to 8. In these graphs effect of contact time, initial dye concentration, pH, concentration of nanoparticles and hydrogen peroxide concentration on color removal efficiency is shown. Results show that increasing concentrations of nanoparticles, hydrogen peroxide, contact time, initial dye concentration and pH reduction to a specified level, increases removal efficiency. Optimum experimental results show that exposure time of 40 min, PH=4, dye concentration of 75 mg/L, concentration of nanoparticles 2 g/L and hydrogen peroxide concentration 200 Mmol, hydrogen peroxide dye removal in process with nanoparticles and hydrogen peroxide about 91 and 34% respectively and by increasing pH to 10, color removal rate of about 27 and 10% reduced. Effects of pH on color removal efficiency are clearly shown in Fig. 4. So that by lowering pH of 10 to 4, removal process, hydrogen peroxide and hydrogen peroxide-iron nanoparticles has increased from 27 to 91 and 10 to 34%, respectively. Fig. 5 shows that with increasing contact time, color removal rate is increased so that by increasing time from 5 to 80 min, removal process, hydrogen peroxide and hydrogen peroxide-iron nanoparticles increased from 50 to 97 and 8 to 29%, respectively. Fig. 6 shows that with increasing concentrations of color, its removal rate is reduced so that by increasing the dye concentration of 25 to 100 mg/L, the removal process, hydrogen peroxide and hydrogen peroxide-iron nanoparticles reduced 99 to 80 and 38 to 26%, respectively. Fig. 7 shows clearly different levels of color removal efficiency of NZVI. With increasing NZVI from 0.5 to 4 g/L at pH 4 and 200 Mmol for hydrogen peroxide, in the process of hydrogen peroxide-iron nanoparticles, color removal rate is increased about 25 to 98%. In Fig. 8 The effect of hydrogen peroxide was investigated in doses of 25 to 300 Mmol, in pH=4 and it was found that the removal efficiency for the highest and lowest amounts of H2O2 was about 8 to 37%. The impact of increased efficiency of hydrogen peroxide color removal clearly has shown in Fig. 8. Efficiency of color removal increases by increasing amount of hydrogen peroxide in presence of NZVI. So that by increasing amount of hydrogen peroxide at a pH of 4 from about 25 to 300 Mmol, color removal rate increases 80 to 99 percent. Results of this study show that acidic pH is effective in achieving maximum color removal. This is a major problem that requires to acidification environment. At lower pH than 3 to formation of Fe(OH)2+ developments with hydrogen peroxide reacts slowly, reduces amount of hydroxyl radicals, resulting in reduced process efficiency. In alkaline pH Fe2+ is also converted to Fe3+ and in Fe(OH)3 state removed from catalytic cycle . In this study, pH of 4 is optimized condition and it’s clear in Fig. 4 that maximum efficiency is achieved in pH=4 and color removal efficiency has decreased with increasing pH. It has been demonstrated in previous studies that solution pH can affect on absorbent surface charges, degree of ionization various contaminants, separating functional groups on active sites attractive and effective dye molecule structures [22, 23] In fact, under acidic pH, linked sites absorbing hydrogen ions works closely with each other as ligands interface (bridge) between absorber and dye molecule. In these conditions, lower pH values, provides favorite conditions for reactive dyes removal [24, 25]. Gulnaz et al removal of reactive dye by Potamogeton Crispus 198 indicates that decrease pH from 5 to 1, increase color removal efficiency that is compatible with results of present study . As shown in Fig. 8 is color removal efficiency increases by increasing amount of hydrogen peroxide at pH=4. This is because of increasing concentration of hydrogen peroxide, which dues to acidification of environment and amplify generates ions Fe2+ and increased production of hydroxyl radicals, and result increasing efficiency of dye removal . Contact time is one of most important parameters for practical applications in adsorption process. Based on results of this study (Fig. 5), removal percent of Reactive Red 198 by adsorbent increased rapidly during early stages of adsorption and then at a slower speed and appropriate time, spend time to reach a state of equilibrium during a period of about 80 min. In other hand, as shown in Fig. 5, dye uptake was very rapid during first 5 min, and then absorbs speed decreased rapidly over time and eventually balance is reached after 80 min, maximum reduction in contact time of 80 min was 97 percent . Generally, rate of removal (adsorbent) is rapid at first, but gradually decreased with time until equilibrium is reached. It is due to fact that at beginning and in early stages of absorption, a large number of empty surface sites are available for absorption, but with spending of time, empty remain site surface, are difficult to absorb pollutants. Which could be due to deterrent forces between molecules adsorb on surface of solid and liquid mass . Similar results have been reported by Gulnaz . In another study, mozia et al have used hybrid membrane system to analyze Acid Red 18 for decomposition in photocalystic process. In this study, color is completely removed in 5 hours had less efficiency compared to presented study . Initial dye concentration, provides a significant driving force to overcome overall resistance substantially phases of mass transfer between liquid and solid colors. With increasing concentrations of color, its removal rate decreases that this could be due to NZVI surface occupation by dye molecules, ions Fe+2 less access to NZVI dye molecules and less access to hydrogen peroxide. This topic is similar to other studies . Adsorbent concentration, an important parameter that effects on absorption and hence determining absorption capacity for a given initial concentration of color is for Reactive Red 198, is important. As is shown in Fig. 7, Removal of Reactive Red 198, is applied by adsorbent dosage and by increasing adsorbent dose increases up to a certain value highly. This result can be explained by fact that absorbtion site, remained saturated during adsorption, while Increasing number of sites available dose increases adsorbents. In another study, mozia et al use photocatalytic process to analyze Acid Red 18. In this study, initial concentration of adsorbents, catalysts dose and reaction temperature were investigated . This process compared to processes of this research is a quite complex process. According that this process iron nanoparticles in presence of hydrogen peroxide, is more accessible, environmentally safer, easy operation with high efficiency rather than other advanced oxidation processes . Widespread use of this method is result of these advantages. Therefore, this process is useful for removal of azo dyes. According to results of research, nanoparticles of hydrogen peroxide has advantages such as high removal efficiency and short reaction time and could be considered as an appropriate option for removal of azo dyes in aqueous environment. But hydrogen peroxide has less efficiency for removal of azo dyes in aqueous the environments. The results confirm, Azo dyes can be removed by this process. When NZVI were used with Fenton process, amount of removing will be increased. 5 factors effects were studied like pH, contact time, initial dye concentration, adsorbent concentration and initial Hydrogen peroxide concentration. Optimized parameters for this process are pH=4, contact time= 40 min, initial dye concentration= 75 mg/L, adsorbent concentration= 2 g/L and initial Hydrogen peroxide concentration= 200 Mmol. 1. Pagga U, Brown D. The degradation of dyestuffs: Part II Behaviour of dyestuffs in aerobic biodegradation tests. Chemosphere. 1986;15(4):479-91. 2. Wang J, Huang CP, Allen HE, Cha DK, Kim D-W. Adsorption Characteristics of Dye onto Sludge Particulates. Journal of Colloid and Interface Science. 1998;208(2):518-28. 3. Oh SY, Cha DK, Chiu PC, Kim BJ. Conceptual comparison of pink water treatment technologies: granular activated carbon, anaerobic fluidized bed, and zero-valent iron-Fenton process. Water Science and Technology. 2004;49(5-6):129-36. 4. Papić S, Koprivanac N, Lončarić Božić A, Meteš A. Removal of some reactive dyes from synthetic wastewater by combined Al(III) coagulation/carbon adsorption process. Dyes and Pigments. 2004;62(3):291-8. 5. Bayer P, Finkel M. Modelling of sequential groundwater treatment with zero valent iron and granular activated carbon. Journal of Contaminant Hydrology. 2005;78(1–2):129-46. 6. Akcil A, Erust C, Ozdemiroglu S, Fonti V, Beolchini F. A review of approaches and techniques used in aquatic contaminated sediments: metal removal and stabilization by chemical and biotechnological processes. Journal of Cleaner Production. 2015;86:24-36. 7. dos Santos AB, Cervantes FJ, van Lier JB. Review paper on current technologies for decolourisation of textile wastewaters: Perspectives for anaerobic biotechnology. Bioresource Technology. 2007;98(12):2369-85. 8. Lu C-S, Chen C-C, Mai F-D, Li H-K. Identification of the degradation pathways of alkanolamines with TiO2 photocatalysis. Journal of Hazardous Materials. 2009;165(1–3):306-16. 9. Özer A, Dursun G. Removal of methylene blue from aqueous solution by dehydrated wheat bran carbon. Journal of Hazardous Materials. 2007;146(1–2):262-9. 10. Robinson T, McMullan G, Marchant R, Nigam P. Remediation of dyes in textile effluent: a critical review on current treatment technologies with a proposed alternative. Bioresource Technology. 2001;77(3):247-55. 11. Qu S, Huang F, Yu S, Chen G, Kong J. Magnetic removal of dyes from aqueous solution using multi-walled carbon nanotubes filled with Fe2O3 particles. Journal of Hazardous Materials. 2008;160(2–3):643-7. 12. Wang C-B, Zhang W-x. Synthesizing Nanoscale Iron Particles for Rapid and Complete Dechlorination of TCE and PCBs. Environmental Science & Technology. 1997;31(7):2154-6. 13. Bigg T, Judd SJ. Zero-Valent Iron for Water Treatment. Environmental Technology. 2000;21(6):661-70. 14. Kusic H, Koprivanac N, Srsan L. Azo dye degradation using Fenton type processes assisted by UV irradiation: A kinetic study. Journal of Photochemistry and Photobiology A: Chemistry. 2006;181(2–3):195-202. 15. Liu T, Wang Z-L, Zhao L, Yang X. Enhanced chitosan/Fe0-nanoparticles beads for hexavalent chromium removal from wastewater. Chemical Engineering Journal. 2012;189–190:196-202. 16. Wang Y, Zhou D, Wang Y, Zhu X, Jin S. Humic acid and metal ions accelerating the dechlorination of 4-chlorobiphenyl by nanoscale zero-valent iron. Journal of Environmental Sciences. 2011;23(8):1286-92. 17. Izanloo H, Nazari S, Ahmadi Jebelli M, Alizadeh Matboo S, Tashauoei HR, Vakili B, et al. Studying the Polypropylenimine-G2 (PPI-G2) Dendrimer Performance in Removal of Escherichia coli, Proteus Mirabilis, Bacillus Subtilis and Staphylococcus Aureus from Aqueous Solution. Arak Medical University Journal. 2015;18(6):8-16. 18. Poursaberi T, Hassanisadi M, Nourmohammadian F. Application of synthesized nanoscale zero-valent iron in the treatment of dye solution containing basic yellow 28. Prog Color Colorants Coat. 2012;5:35-40. 19. Frost RL, Xi Y, He H. Synthesis, characterization of palygorskite supported zero-valent iron and its application for methylene blue adsorption. Journal of Colloid and Interface Science. 2010;341(1):153-61. 20. Gulnaz O, Sahmurova A, Kama S. Removal of Reactive Red 198 from aqueous solution by Potamogeton crispus. Chemical Engineering Journal. 2011;174(2–3):579-85. 21. Chamarro E, Marco A, Esplugas S. Use of fenton reagent to improve organic chemical biodegradability. Water Research. 2001;35(4):1047-51. 22. Yang GCC, Lee H-L. Chemical reduction of nitrate by nanosized iron: kinetics and pathways. Water Research. 2005;39(5):884-94. 23. Ai L, Zhang C, Liao F, Wang Y, Li M, Meng L, et al. Removal of methylene blue from aqueous solution with magnetite loaded multi-wall carbon nanotube: Kinetic, isotherm and mechanism analysis. Journal of Hazardous Materials. 2011;198:282-90. 24. Li X-q, Elliott DW, Zhang W-x. Zero-Valent Iron Nanoparticles for Abatement of Environmental Pollutants: Materials and Engineering Aspects. Critical Reviews in Solid State and Materials Sciences. 2006;31(4):111-22. 25. Tang WZ, Chen RZ. Decolorization kinetics and mechanisms of commercial dyes by H2O2/iron powder system. Chemosphere. 1996;32(5):947-58. 26. Shu H-Y, Chang M-C, Chang C-C. Integration of nanosized zero-valent iron particles addition with UV/H2O2 process for purification of azo dye Acid Black 24 solution. Journal of Hazardous Materials. 2009;167(1–3):1178-84. 27. Reardon EJ, Fagan R, Vogan JL, Przepiora A. Anaerobic Corrosion Reaction Kinetics of Nanosized Iron. Environmental Science & Technology. 2008;42(7):2420-5. 28. Hsing H-J, Chiang P-C, Chang EE, Chen M-Y. The decolorization and mineralization of Acid Orange 6 azo dye in aqueous solution by advanced oxidation processes: A comparative study. Journal of Hazardous Materials. 2007;141(1):8-16. 29. Mozia S, Tomaszewska M, Morawski AW. Removal of azo-dye Acid Red 18 in two hybrid membrane systems employing a photodegradation process. Desalination. 2006;198(1):183-90. 30. Keshmirizadeh E, Eshaghi S. Removal of Anionic Brown 14 and Cationic Blue 41 dyes via Fenton Process. Journal of Applied Chemical Research. 2015;9(1):83-93. 31. Shojaei S, Shojaei S, Sasani M. The efficiency of eliminating Direct Red 81 by Zero- valent Iron nanoparticles from aqueous solutions using response surface Model (RSM). Modeling Earth Systems and Environment. 2017;3(1):27. 32. Mozia S, Tomaszewska M, Morawski AW. Photocatalytic degradation of azo-dye Acid Red 18. Desalination. 2005;185(1):449-56.